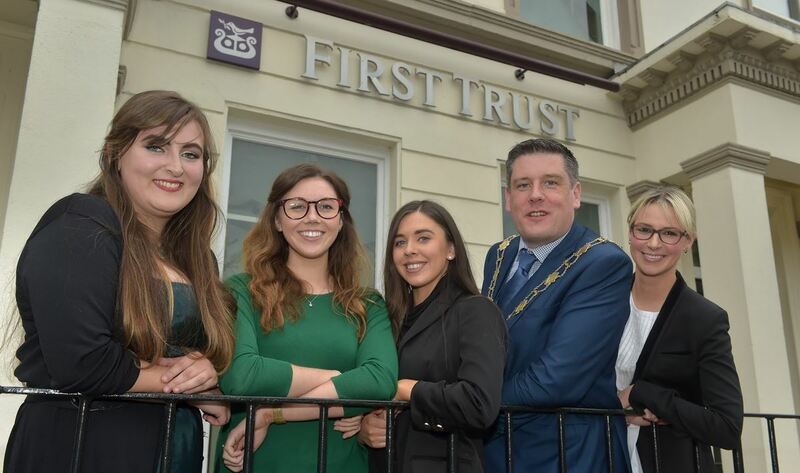 Queen’s Graduates’ Association (QGA) awarded two scholarships – each worth £2,500 – to Caoimhe Bond and Joan Aiken at its second annual President’s Drinks Reception at First Trust Bank’s University Road Branch on Tuesday 23 May. Caoimhe Bond, an MSci (UM) Physics graduate from Portstewart is currently in her second year of a PhD in Physics. Her doctorate project focuses on creating a new highly sensitive detection technique for changes to chiral molecules. With a patent in place and plans to turn her research into a commerical instrument, Caoimhe is already in discussions with local pharmaceutical companies. Joan Aiken, a postgraduate Psychology student from Belfast, was recognised for her research on how infant and child-care giving impacts on the developing biological systems of the child within the context of childhood adversity. Joan hopes her research, which is tackling one of the biggest health and economic challenges of our time, will inform childhood policy and address a problem which costs an estimated £17bn in the UK. Feargus McCauley, President of the QGA said: “The Spring Drinks Reception is a recent addition to our calendar of events. It provides an opportunity for members to reconnect and network and also to hear from the student recipients of our annual scholarship awards. “This year’s winners were incredibly worthy, having seriously impressed the panel with details of their fascinating research projects. We were also glad to welcome back Erin Early and Cliodhna McNeill – our 2015/6 recipients – and to hear how the scholarships helped their academic achievements to flourish,” he added. Speaking at the event, Erin Early said: “Being awarded the QGA scholarship was a great privilege and the highlight of my academic career to date. Becoming a recipient of the scholarship hugely benefited me both personally and academically. “It meant I was able to leave part-time employment and dedicate all my time to my Masters. This was hugely beneficial as I graduated in December 2016 with a Distinction in Social Research and secured my position as a PhD student in Education within the university. Cliodhna McNeill added: “Not only did the QGA Scholarship enrich my studies, but it made my time at Queen's as a post graduate student much more enjoyable and, at times, much easier. “After receiving the QGA Scholarship last year I proudly included it in my CV. I have no doubt that this prestigious award made me stand out as a candidate and secured me the jobs and positions I have since received. I was able to invest in a state-of-the-art laptop, travel to enrich my studies and pour all my energy into my studies alone thanks to the QGA and their financial support. The Queen’s Graduates’ Association Scholarship programme rotates each year around the three University faculties, with each School within the selected faculty tasked to put forward their best student for the award. The winners are chosen by an independent panel.